I’ve done a couple posts about pizza in NYC already. I was on the search for the BEST pizza in the city, so had to try all the famous spots. Lombardi’s is special because it was the FIRST PIZZERIA ever to open in America in 1905. 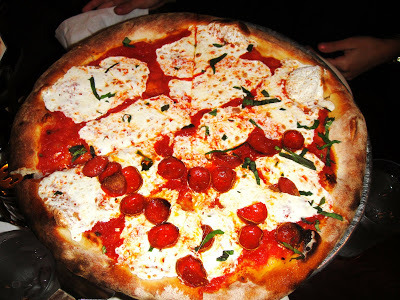 To this day, Lombardi’s is still known for being “one of the best Pizzerias in America”, and also according to many magazines & newspaper articles, the best pizza in New York City. I went to Lombardi’s and was so excited to try authentic New York Style Pizza. This place is legendary in New York City. I had the BEST pizza I ever had in my life in Brooklyn (at Di Fara’s, check out my blog post about it), so I was curious to see how Lombardi’s was going to match up. I went around lunchtime, and the place was packed. There was a line out the door, but thankfully service was fast and efficient so I didn’t have to wait long. Lombardi’s is located on Spring Street in SoHo, next to all the fun shopping and cute restaurants. I went with my sister and we ordered a small whole pizza (6 slices) of half margarita, half pepperoni. The pizza was good. It wasn’t my favorite pizza I had in the city though. It had everything right- it looked amazing, the texture was on point, but for some reason it was lacking flavor to me. It’s not that I didn’t like it, but I wasn’t “WOW’ED” if you know what I mean. I’ve had better. I would like to go back again and give it another chance, it usually always tastes different the second time around. Regardless of my experience, everyone should visit Lombardi’s when they are in NYC. It’s legendary and has a lot of history. It’s authentic New York Style pizza that has been open for nearly 100 years- it is worth to try at least once. I’m sure native New Yorkers have battles about what pizzeria’s are the best in the city, and I’m sure the majority say Lombardi’s is number one. I happened to LOVE Artichoke, which is another pizzeria in the city, and Di Fara’s in Brooklyn is my number one. (Check out my blog postings for both of these pizzerias as well). If you are familiar with pizza in New York, or anywhere for that matter, I would love to hear where your favorite pizzeria’s are 🙂 Feel free to comment and give me some insight!